The Local Government Act 2002 states that the purpose of local government is to enable democratic local decision-making and action by, and on behalf of, communities; and to meet the current and future needs of communities for good quality local infrastructure, local public services, and performance of regulatory functions in a way that is most cost-effective for households and businesses. Here at Carterton District Council we work hard to ensure that we do this and strive to deliver, effective and efficient core services. These services provide for the daily needs of our community, including a clean, safe drinking water supply, refuse collection, environmentally disposing of waste water, maintaining rural roads and streets, local regulations, economic development, town planning, library services and providing welcoming spaces for our people to carry out their recreational activities. To ensure that we are doing our job well, our performance often needs to be evaluated. A way in which we can do so is through targeted community surveys which provide valuable feedback on our overall performance. Our recent Carterton Residents Survey has provided us with this valuable information, and I am happy to say the results were very pleasing. At an overall level, 67% of our residents were either satisfied or very satisfied with our Council’s performance. With such a broad range of areas for our performance to be rated this percentage is great news. 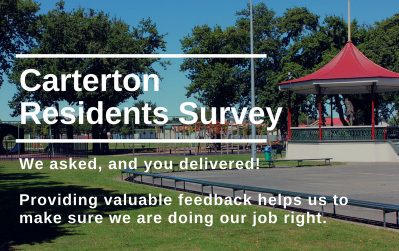 These results are a really big pat on the back for our service and operations teams who are passionate about making Carterton a wonderful place to live. Not only do they accomplish this through our operational structure, but they also work alongside committed community groups and volunteers to ensure that they are delivering services and facilities that meet the needs of our people. Our waste management services and Water management were also considered very highly among our residents. Although all of this makes for positive reading, the survey identified a need for us to demonstrate better value for the rates that the ratepayers are paying, and to provide greater clarity around how residents can get involved with decision making. Elected members and Council staff are taking this feedback and the challenges to improve in these areas with great enthusiasm. We never like to rest on our laurels and therefore we strive to excel at delivering our services while endeavouring to provide value for money to our ratepayers. As Carterton’s Mayor I am personally really pleased with how our residents have rated our performance. Providing day to day services for a district can be challenging, but reviewing these results fills me with great confidence that our organisation has a recipe for success, and puts the needs of our community first. A big thank you to all the residents within the district who set aside their valuable time to complete our residents survey. I am very humbled to have such an engaged Carterton community. You can read the full report of the Carterton District Annual Residents Survey 2017, here.